As many of you may know, INFIX believes in a "conscious coaching" methodology. We think it's extremely important for individuals to have a reason behind everything they "do" and to understand that what they "do" can have a tremendous impacts on others. Next time you start a new project or task ask yourself, "Why am I doing this?" or "What impact will this have on others?" One of INFIX's clients, Beacons Point, was inspired by our conscious coaching approach. Through this inspiration, INFIX and Beacons Point teamed up to do something amazing! In the last few months, California has experienced some of the worst fires in state history. The recent fires scorched over 245,000 acres and claimed 88 lives. Recovery efforts are ongoing as many people still remain missing. We knew that we wanted to do something to help the firefighters and first responders and express our gratitude for their bravery and relentless efforts to keep our communities safe. We were conscious of the reason why we wanted to help and we also understood the desperate need for community involvement and support. Being conscious about what we "do" can lead to amazing transformations and triumphs. With only a few days to prepare, the fundraiser went off without a hitch! 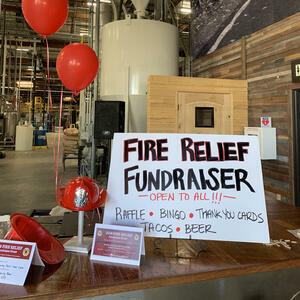 We raised over $2,200 for the Los Angeles Fire Department Foundation and brought the community together for a common cause. I've found that if you live by this approach of conscious coaching you will always find a path to success. Thank you to everyone who came and supported the event!